2017 is the 4714th Chinese Year. 2017 Chinese New Year Day is on January 28, 2017. Chinese Year of Chicken begins on February 3, 2017 according to Chinese Astrology Calendar. 2017 is the Year of Fire Chicken. Fire is connected to the color of red. Therefore, 2017 is also called Year of Red Chicken. Chinese Astrology is a prediction theory using Yin-Yang Five Elements. The astrological birth chart built by Chinese Astrology Calendar is a combination chart of Yin-Yang Five Elements and 12 animals. Five Elements are Metal, Water, Wood, Fire and Earth. Twelve animal are Rat, Cow, Tiger, Dragon, Dragon, Snake, Horse, Sheep, Monkey, Chicken, Dog and Pig. All animal signs can be converted into Five Elements, Therefore, every birth chart has its own Five Element weights. Chinese Astrology use Yin Yang balance theory to predict people's fortune. 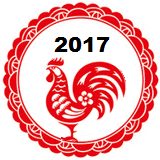 The Chinese astrology symbol for 2017 Red Chicken Year is . Before predicting your 2017 fortune regarding to your money, career, marriage or health, you have to know what Type of Element you are and what your Lucky Element is. The Lucky Element is the major factor to determine people's good fortune. 2017 is the Year of the Red Fire Chicken, which is the Female Metal. If your Lucky Element is Metal, then 2017 will bring you some degree of fortune. For details and an accurate predictions, the first step to know your fortune is to know which elements and animals are in your birth chart. You can find that information from the Chinese Astrology Lucky Element page using your birthday and birth time. The following is the example of the Chinese Astrology Birth Chart. This person was born on June 15, 2008 or June 30, 1948. The symbol of the upper row of the Day Column (a.k.a. Day Master) represents the person. So we can say Day Master is Male Fire, which represents this person. The birth chart has too little Metal and needs more Metal to balance the Five Elements. Therefore, the Lucky Element is Metal. 2017 is Female Fire Chicken year. Chicken contains mainly Female Metal, which is connected to jewelry, precious gems, fine metal or valuable treasure. Since Metal represents money to the person and Metal is the lucky element, Metal will bring fortune to this person. Female Fire of 2017 represents the siblings or friends, which are connected to social activities and money expenses. That implies people around this person will come to share the money income. Therefore, this is the sign of money in and out. 2016 is the Year of Monkey and 2017 is the Year of Chicken. Both of Monkey and Chicken are in the Metal group. Your fortune in 2017 will be similar to 2016. If you have good luck in 2016, your luck will continue. The luckiest period will be in the fall season. The Chicken year is the time to review the result of diligent job. If you work harder, then you will gain more in the end of the year. Metal is afraid of Fire. Metal and Fire are opposite elements. Most people will have mixing good and bad news in 2017, the year of the Chicken. Chicken is also related to the fog, carbon dioxide, virus or unhealthy air. For your health, you had better pay attention on your respiratory system. The followings show people's luck in 2017 based on their Luck Element. It's good sign for your luck, since Chicken of 2017 contains Metal. Metal and Fire are opposite elements. Fire of 2017 will bring pressure on the Metal. You won't see too much luck during the first half of 2017. Metal will become stronger in the autumn, your luck will become much better. Everything will come your way in the second half of 2017. It is good. The year of 2007 contains Fire and Metal. Water is not afraid of Fire. Fire won't cause a big issue to you. Metal s the mother element of Water. Metal of Chicken is active in the autumn. Water will be stronger in the winter. Therefore, your lucky will be better in the second half of 2017. It is average. Fire of 2017 is related to the heat, temperature or energy. Fire can help Wood (tree) grow faster and stronger. The first half of 2017 should be stable. Metal of Chicken is unfavorable to Wood. Your Lucky Element will become weaker during the autumn. You will encounter some trouble and be busy to solve the problem. You will get more help in the winter of 2017.
t's very good. Fire of 2017 will bring your luck during the first half. You will have better luck during the summer. Chicken contains Metal. Metal is afraid of Fire. That means Fire has the advantage over Metal. Your luck will be weaker after summer. If you have big decision to make, then you need to think twice before taking the action. During the winter, You should become conservative for the risky investment. It is above average. Fire of 2017 is the mother element of Earth. Earth will receive the energy from Fire. Your luck will be good in the first half of 2017. Metal of Chicken is the child element of Earth. Earth will weaken when taking care of Metal. That means the index of your luck will go down a little in the second half of 2017. The following table informs people's what event may occur in 2017 based on their Day Master Element Type. Day Master is the upper row symbol in the Day Column of the Birth Chart. 2017 is Female Fire Chicken year. Metal is afraid of Fire. Fire brings you pressure. Therefore, Fire of 2017 represents your job, career, boss, police or law. Your behaviors or activities will encounter some restrictions. Or your work at company will bring you some pressures. If your Day Master is Female Metal , then you will feel more pressure. If your Day Master is Male Metal , then the challenge from Fire is the career opportunity. Chicken of 2017 contains mainly the Female Metal. Metal presents your siblings, friends, coworkers or same generation relatives. If you encounter trouble, they will be around and ready to help you. If your job or business encounter the frustration, then you should be able to find the saviors. That means your career luck is good in 2017. If you are male, then you will focus more on your career in the Fire Chicken Year. Chicken is related to same generation friends. Therefore, you will attend more social activities. Your social expense will increase. You may even become involved in a money relationship with close friends or relatives. If Metal is your lucky element, then they can help you to bring in more income. But if Metal is an unlucky element, then you will end up spending money on them. But they shouldn't cause big money trouble, because Fire of 2017 can overwhelm the Chicken Metal. Therefore, Fire of 2017 can help you to save money. If you are female, then your love relationship is very good. If you are single, then you should have good opportunities meet boys. If your Day Master is Male Metal , then you have better chance to find your true love. If your Day Master is Female Metal , then you will feel some pressure from the love relationship. Sometimes, you will concern about the safety when meeting a boy. If you are married, then you will spend lots of time with your lover. The major events coming toward you are related to career, friendship and money. 2017 is Female Fire Chicken year. Water can extinguish Fire. Fire of 2017 represents money to you. Therefore money related events will appear in 2017. If Fire is your lucky element, then you will have very good money luck. Chicken of 2017 contains Metal, which related to your parents, elders, supporters or helpers. Therefore, you will spend some time to contact with your parents and elders. If you encounter money related issues, someone caring you will appear to give you financial advices or supports. If you are taking education or learning new skills, then you might not be able to focus on learning the knowledge. You will be distracted by the ease and luxury life style. You will mix too much social life with education time. If your Day Master is Male Water , then your love relationship is excellent in 2017, because Female Fire of 2017 and Male Water have an attraction relationship. If you are single, then 2017 is a great time to find a long-term relationship. If you are in love now, then you can consider about the engagement or wedding. If you are married, then both of your love and people relationships are wonderful. The sign of love relationship is much stronger to men than women. If your Day Master is Female Water and you are male, then you still have good opportunities to meet girls. You still can build good relationship. If you are female, then you will focus more on money, investment and property. The major events coming toward you are related to wealth, education, health, fame and relationship. 2017 is Female Fire Chicken year. Wood can be burnt into Fire. So people can pay attention on it. Female Fire is connected to light bulb, flashlight, lamplight or candle fire. Female Fire can beautify the Wood. Therefore, Fire of 2017 represents your outlook, performance, speech, behavior, freedom or expression. If you like to express your opinions often, you may become popular in your social life. Therefore, Fire is related to your fame or reputation. If Fire is your Lucky Element, then people will like your ways and give you good reputation. Chicken of 2017 contains mainly Metal. Wood is afraid of Metal. So Metal presents the career, pressure or law. You will spend most of your time on job or business in 0217. Fire of 2017 is related to light bulb. Chicken is Female Metal, which related to ornaments. If your Day Master is a strong Male Wood , then you will become a Christmas tree decorated by Fire Chicken. Fire of 2017 is also related to summer temperature. Female Metal is also related to fruit. The sign of Fire Chicken to you is the ripened fruit on the tree. This implies your career luck will bear fruit and people will give you good compliment in 2017. If your Day Master is Female Wood , then you will have good career opportunity too. Female Wood is connected to grass, vine or tiny plant. Therefore, your Wood in your birth chart cannot be too weak, otherwise, Female Wood will some pressures to carry to fruit or decorations on it. Metal is related to you job. Metal is afraid of Fire. Fire is related to your performance, speech and behavior. Therefore, if your impropriate words and acts in the working environment could jeopardize your job. If you are male, then there is no strong sign regarding to love relationship. If you are female, then you have the chance to acquaint with someone. But you still need to watch your words and behaviors. Otherwise the boy will walk away. 2017 is Fire Chicken year. Day Master Fire and Fire of 2017 are same kind of element. So Fire of 2017 stands for your friends, siblings, or same generation relatives. They will come to visit you often in 2017. Your social activities will increase. When getting together, friends or relatives will compete or cooperate with something. They could involve the money. If Fire is your Lucky Element, then you and your partners will easily earn money together. If Fire is an unfavorable element to you, then your relatives or friends will bring money trouble to you. The Chicken of 2017 is Female Metal. Metal is afraid of Fire. Metal is something you can conquer. So Metal is connected to your money, finance or wealth. If you want to win money, then your Fire must be stronger than Metal. Therefore, if your Day Master Fire is strong, you have great opportunity to earn extra income in 2017. If your Day Master is weak, then money could bring you pressure. You should stay away from the big return risky investment. Metal of Chicken are Fire of 2017 are opposite elements. Both of them involve the money. Therefore, your money luck in 2017 is that money goes and comes. You could earn something extra and then spend some later. You could invest money first and then get a decent return later. If you are male, then Metal of Chicken represents your girlfriend or wife. If you are a single male, then 20017 is a good year to look for a true love. If your Day Master is Male Fire , then your love relationship is excellent. If you are in love, then you probably will think about living together, engagement or wedding. This is because Male Fire and Female Metal of Chicken have the attraction relationship into Water. If Metal and Water are your Lucky Elements, then your love, money and career luck all come to you in 2017. In general, the major events coming toward you will be related to money, love and friendship. 2017 is Fire Chicken year. Fire is the Mother Element of Earth. Therefore, Fire of 2017 stands for your parents, elders, protection, knowledge, education or medicine. During the Chicken year, you will often contact elders or persons who care you. Or you will spend more time to increase your knowledge. Or you will pay attention to your health. Or you will think about your property investment. Or you feel lots of support and help at work. Chicken contains mainly Metal. Metal represents your outlook, performance, expression or behavior to people. That means you will have more opportunity to express yourself in public. You will feel more freedom to do what you want to do. You will explore yourself in the limelight. People will give good reputation or criticize your opinion. Therefore, Chicken of 2017 is connected to your fame. Wood represents your career. Water represents your money. Neither Water or Wood is in the Fire Chicken year. That implies you won't see the significant changes in your career and monkey states. But Fire of 2017 can release your pressure from your job and make your daily job easier. Chicken of 2017 bring you idea to create more income. Therefore, your career luck and money luck are okay in 2017. The first half of 2017 is favorable to career. The second half of 2017 is favorable to investment. Since Fire and Chicken Metal are opposite elements. The first half of 2017 is unfavorable to money. The second half of 2017 is favorable to career. If you successfully win something in the beginning of 2017 and you want to continuously win in the second half of 2017, then you might have to change different method or path. The major events of 2017 will involve your reputation, fame and investment.